Doomsday prepping has been all-the-rage in recent months, with prophecies of the December 21, 2012 Mayan Apocalypse swirling around the heads of survival enthusiasts. But NBC’s new primetime series “Revolution” presents the idea that the world won’t end, but it may change for the worse. As unlikely as it seems, certain phenomenon like solar flares and electromagnetic pulses can incapacitate electrical devices. To make sure no customer is left in the dark, Disaster Relief Supply recommends products crucial in off-the-grid preparedness. Doomsday prepping has been all-the-rage in recent months, with prophecies of the December 21, 2012 Mayan Apocalypse swirling around the heads of survival enthusiasts. But NBC’s new prime-time series “Revolution” presents the idea that the world won’t end, but it may change for the worse. As unlikely as it seems certain phenomenon like solar flares and electromagnetic pulses can incapacitate electrical devices. To make sure no customer is left in the dark, Disaster Relief Supply recommends products crucial in off-the-grid preparedness. Mike Fisher from Disaster Relief Supply explains that the most important aspect of off-the-grid preparedness is food and water. “Survival starts with water, then food,” Fisher says, “If electricity was to end tomorrow, I wouldn’t want to leave my home in search of food and water, I’d want a supply for me and my family to last at least a month.“ Fisher adds that the food and water must have a long shelf-life, so he recommends non-perishable goods. The epitome of non-perishable goods according to Fisher is water stored in large food-grade containers, and freeze dried/dehydrated, or canned foods. Along with food and water, Fisher recommends more emergency supplies in case of an indefinite, wide-spread, electrical blackout. Water purification: Water purification falls in the category of food and water, but in a different way. In a long-term emergency, stored water will only last so long, and eventually will require treatment after standing in one place for so long. Water purification can be done a few different ways. The most common techniques for water purification is boiling or a small amount of Clorox bleach. 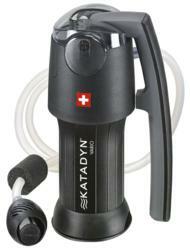 Filters and purification devices also produce clean, drinkable water like the Katadyn Vario Microfilter, or Sawyer 2 Liter Water Filtration System. Heat/Light Source: Without power, it is difficult to produce heat or light, especially on a regular basis. For this, Fisher mentions specialized matches and lighters that are either waterproof, or produce a longer-lasting flame. Also, fuel sources like propane and kerosene can be used in conjunction with certain appliances for non-electrical production of heat or light. Home/Personal Protection: Personal security becomes a major issue when the power goes out. Any break in societal stability causes some to extend the limits of acceptable or even moral behavior. It’s common behavior in movies, but riots, looting, and crime have in-fact been present in history during blackouts. During the New York blackout of 1977 where 1,616 stores were looted, 1,037 fires were started, and 3,776 people were arrested according to a 2003 New York Times article. “The New York blackout of 1977 lasted just one day; imagine the effect of an indefinite loss of all electricity,” Fisher states. “People shouldn’t underestimate what humans are capable of.” In this instance, Fisher recommends non-violent items that will protect health and property including fireproof combination lock safes, sand bags, and extra plywood and nails to bar off home entrances and first aid supplies in the event that violence or illness does occur.